Margie Hoffnung, the GT’s conservation officer, and two representatives from the Gloucestershire Gardens and Landscape Trust, were invited by the National Trust to visit Lodge Park in order to hear about their plans to replant and restore the Charles Bridgeman landscape. The long-term project is based on the recommendations of a Conservation Management Plan (CMP) prepared by Chris Gallagher and Sarah Rutherford. They prepared the CMP following the discovery of Bridgeman’s plan in the Bodleian Library in Oxford and a subsequent Lidar survey proving that the scheme had actually been carried out. 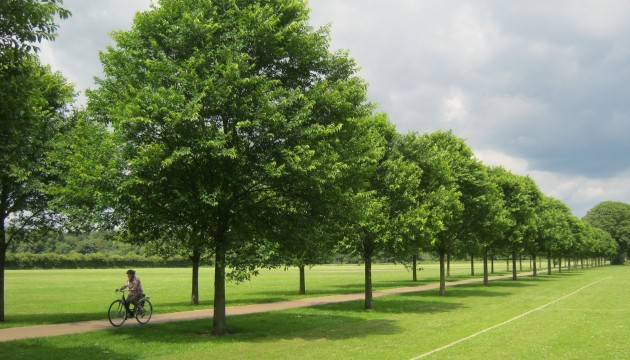 The first phase will be the partial reinstatement of an avenue, and the National Trust are keen to put elms back. Previous attempts to find elms resistant to Dutch Elm Disease have been unsuccessful, as all the introduced clones have failed after a few years. Initial scepticism about using elms has now turned to cautious optimism. The variety chosen, Ulmus ‘New Horizon’ is a hybrid, raised by the Wisconsin Alumni Research Foundation from a cross between Japanese and Siberian elm clones (above, growing in Pontcanna Fields, Cardiff, photo © Hilliers). It has been marketed in Europe by a German company, protected under EU breeders’ rights, as one of the ‘Resista’ elms. In England Hilliers have exclusive growing rights for this tree and each tree is sold with its own microchip to prevent fraud. Reading about these trees is one thing, but it is quite another to see them growing in situ. The garden of His Royal Highness the Prince of Wales at Highgrove has three specimens planted in 2004. Highgrove is in a Dutch Elm Disease ‘hot spot’: the entire elm trial planted in 1988 one mile away at Westonbirt Arboretum all failed. A visit to the garden confirmed that all the Prince of Wales’s trees were in excellent health and fast growing, although they had received no formative pruning. After a subsequent visit to Hilliers, it became apparent that if this does not happen, these elms are prone to double leaders and excessively bushy branching. Formative pruning avoids this, and the tree grows into an evenly shaped, rounded tree. A second equally resistant hybrid, Ulmus ‘Rebona’, from the same parentage, is noticeably more fastigiate. They have been available for 14 years and as far as Hilliers are aware, none have succumbed to Dutch Elm Disease. This is extremely encouraging, especially for the restoration of historic designed landscapes, as it presents a real opportunity to reintroduce elms, which had been such a feature of our historic parklands and avenues.